So much to do….so little time! The calendar says it has been spring since March 21, but the weather didn’t seemed to get the memo. Here on the farm we’re trying to get ourselves ready for planting season. We are getting the oil changed in the tractors, putting new parts on the corn planter, adjusting, cleaning, planning….. We are getting lots of things done, but it’s a very long list! And wet, cold weather is not conducive for the the outdoor jobs. But I do know, that when the weather does straighten up and the fields are dry, we’ll be ready! Growing food is a frustrating, amazing, difficult, fun, challenging and yet rewarding exercise. Here on the farm we can’t wait to get going on all the jobs. How about you? Doing some gardening this year? I hope that you can–because no food tastes quite as good as the food you grow yourself! As is our tradition in the fall, our farm market closes the first Saturday after Hallowe’en. I am really glad that we have chosen that date to close because this year, November’s weather was, well, less than ideal! The combination of some very cold, sometimes snowy, sometimes wet and almost always grey weather has made it difficult to get fall work done. Everything from getting the straw on the strawberries to getting everything stowed away for the winter was challenging. And for my neighbours, who have crops still in the field waiting to be harvested, this fall’s weather has being very frustrating. I’m hoping that the brunt of winter can hold off until at least Christmas. 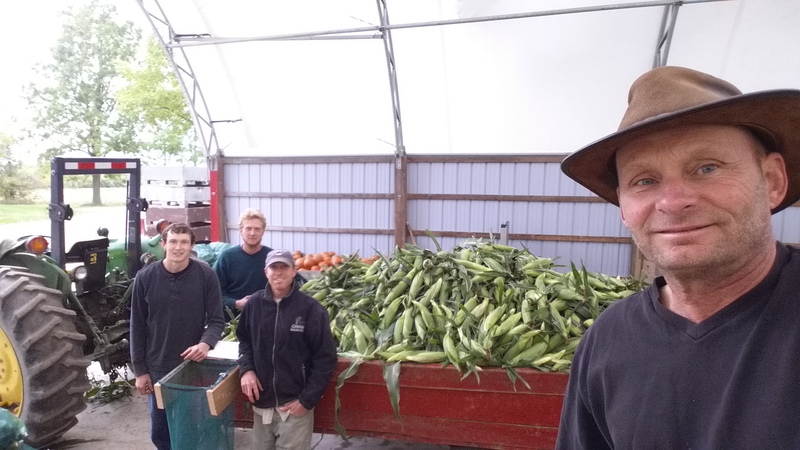 Looking back, it was a great farming season with excellent crops of strawberries, sweet corn, pumpkins and squash. Sure, a couple of our minor crops were a little disappointing, but there’s always next year. 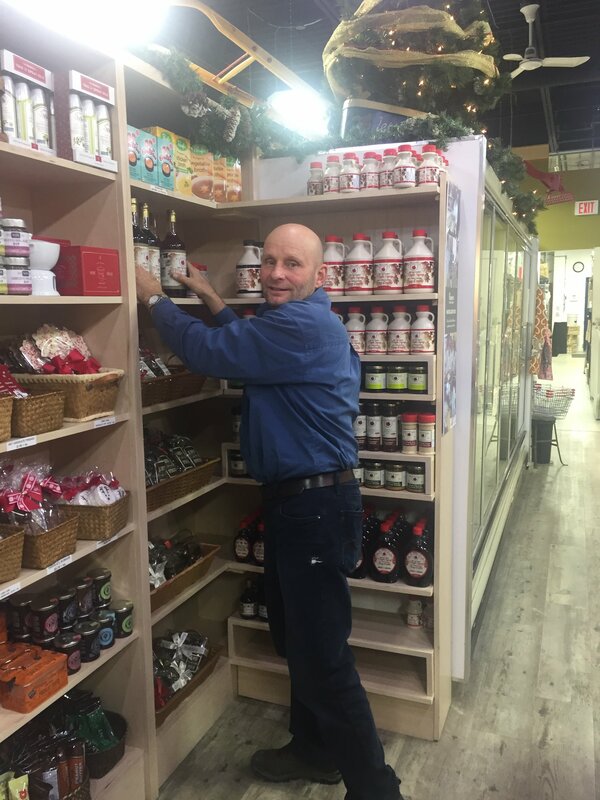 We’re always thankful for our wonderful customers stopping by regularly to support us. At this point, southern Ontario is fortunate to have fairly steady and consistent weather patterns, favourable to growing good crops. I am very grateful for good soil and reasonable weather to grow our crops. I’m also grateful for amazing people with whom to work helping us to grow good food. Not everyone in our world has this privilege! Wow! Another year almost finished and if you’re like me it’s hard to believe! 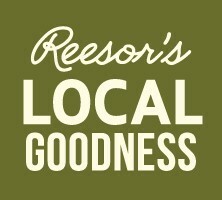 This year marks the 31st Christmas of Reesor’s Farm Market. It’s easy for me to remember that anniversary because that’s the year our first daughter was born, and 31 years later I’m now a grandfather! In those 31 years lots has changed here on the farm. 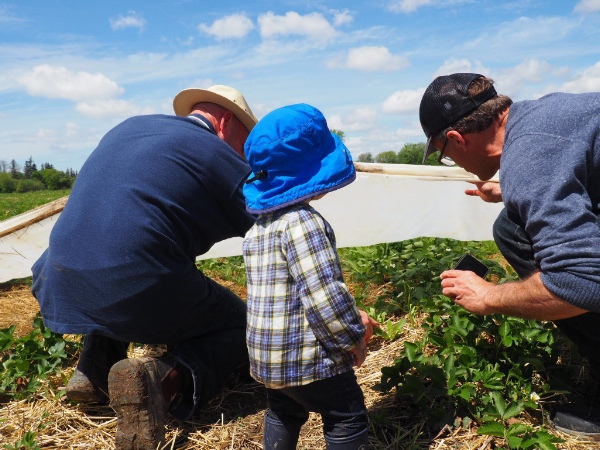 I now have many more people to help harvest the corn and pick the strawberries and make sure all of the crops are tended well and sold at our market. Back in the old days it was just me! As well, we have more labour-saving equipment which is a real help to everyone here. When I was a younger farmer we even had livestock here on the farm including pigs and chickens which made for lots more work! But some things haven’t changed. We are still doing our best to care for the soil and grow healthy, nutritious crops. We are still trying to be good neighbours to those near and far and still wanting to live simply so others can simply live. Have a Merry Christmas and may 2017 be a wonderful year for you and yours. In the photo above photo Jay is in a sweet corn field that was planted with oats last summer to protect and build the soil for next year . It’s the time of the year when we head to the field to cut pumpkins. No, we don’t go and make jack o’lanterns, but we do cut the pumpkins from the vines and put them in bins to bring to the market. And we do have some nice pumpkins in the field this year despite the dry, dry summer. All of the pumpkins are a little bit smaller than they would be if we’d had normal rainfall, but the quality is still very nice. And speaking of quality: plant breeders have not only produced some much improved pumpkin varieties, but improved varieties of other crops as well. They’ve improved the sweetness and tenderness of our corn and the stem quality on the pumpkins and bred green beans to mature uniformly on the plant to facilitate harvest. All of this has been done with plant breeding and not genetic engineering. Hey there high school and university students who love science. Looking for a calling? Consider plant genetics and plant breeding and make an important contribution to our community and the world’s food supply!